Authorities in Indonesia’s West Java have issued a decree which severely limits the activities of a small Islamic sect called the Ahmadiyah. Members will not be able to publicly identify themselves and are being urged to convert to mainstream Islam. Indonesia is a secular country, where freedom of religious expression is enshrined in the constitution. But recently the government has been under pressure from hardliners to ban the sect completely. The province of West Java is home to Indonesia’s largest community of Ahmadis, but there are estimated to be more than 200,000 throughout the country. But now they will be much harder to find. The local authorities want them to limit their activities, take down signs identifying their mosques and schools, and - ideally - to re-educate and re-integrate themselves within mainstream Islam. They are even encouraging other people in the area to monitor what the Ahmadis are doing. Lawyers for the Ahmadiyah say the decree violates a law protecting people’s rights to worship how they choose. 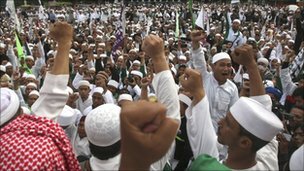 But hardline Islamic groups say the order is perfectly legal, claiming that the sect’s beliefs deviate from the tenets of Islam and therefore violate the country’s rules against blasphemy. The hardliners have repeatedly petitioned the government to outlaw the Ahmadiyah completely, and they are finding an increasingly positive reception. Even the minister for religion supports a ban. The Ahmadis have already been keeping a low profile since three of their members were killed last month by an angry mob. This decree is yet another sign that their way of life is no longer welcome in a country often lauded for religious tolerance.